In the last three years, bike share programs have exploded in cities like Minneapolis, Washington, D.C. and Boston, and New York City and San Francisco are poised to add major programs of their own. The programs have been widely popular thus far, but to some, bike-share still seem like a highly public project that adds little to the public good. Indeed, concerns about safety and the potential to negatively impact businesses and existent transportation systems can outweigh perceived benefits. But in practice, bike share is an affordable, healthy and environmentally friendly transportation source that augments city commerce and quality of life. This statement seems logical, but consider who is most likely to use a bikeshare system: probably not the person who already owns a bike, right? Bikeshare is actually a great way for non-cyclists to be introduced to the health benefits of cycling, and instead of cannibalizing members from the current cycling community, it serves as an outreach tool to those who don’t own foot-pegs and a titanium bike-lock. In cities with bikeshare, you see a surprising number of users in suits and skirts. Tourists and other day users can use the system in lieu of expensive taxi cabs or renting a car. If anything, bikeshare programs are the best way to encourage healthy, more environmentally friendly transportation habits in those to whom active transport may not come naturally. Cities with large bikeshare networks actually report that the majority of their users are frequent customers who use bikeshare as a commuting tool for work, errands and entertainment destinations. Instead of a novelty curio, think of bikeshare as a mode of transportation akin to busing. Just like a bus, bikeshare stations are not everywhere, but they are plentiful enough that you can get just about anywhere with a few blocks of walking. Also like buses, bikes might not be available right when you want one, but before long, one will come along. Understanding bikeshare as a personalized mode of public transportation is a smart way to recognize the widespread benefits of such a flexible and versatile system. And get this: in Washington DC, nearly 75 percent of users are annual members, and half of Boston’s riders are on high-value year long contracts. In practice, bikeshare programs may gain the majority of their revenue from the relatively more expensive day passes, but that simply subsidizes cheap annual contracts for the bulk of users. One worry is that bikeshare will decrease the quality and quantity of public transportation options by diverting public transportation revenue. In fact, the most frequently used bikeshare stations are at the busiest public transportation stops, indicating that bikeshare is used as a supplement, not a replacement, to traditional transportation options. A person is more likely to use buses and trains when he or she uses bikeshare in conjunction with traditional public transportation because biking can help cut out awkward transfer times and straighten out indirect routes. If non-cyclists are flooding the road, it stands to reason that safety would be an issue. But Boston’s program reports a lower incidence of crashes amongst bikeshare users than in the larger cycling community. The reason isn’t clear: perhaps it’s because bikeshare bikes are slower and more upright than private bikes, or because bikeshare users are generally less aggressive, or maybe it’s a natural aversion to wrecking property owned by someone else. Whatever the reason, relative to the general population, bikeshare users are at no greater risk. Drivers may object to having more cyclists on the road, but remember: that’s just one fewer car you’re stuck behind at a stoplight. Sometimes bikeshare stations and accommodations for cyclists (like bikelanes and car-free zones) decrease the number of parking spaces or roadways outside businesses. This can lead to the misconception that bikeshare hurts businesses. But a bike station holding ten bikes can fit in the space needed for just two parking spaces. In some areas of Boston, that translates to 25-35 trips in and out of that station per day, bringing a good deal more people to a business storefront than traditional parking spaces. I’ve never heard arguments #3 and #5 – maybe they are indeed “myths”. #4 is good news, I’m a big fan of bikeshare and I’m concerned about this, especially in an NYC context. I think bike-share will be very beneficial to NYC but only when it gets started in 2012. I don’t remember the ‘explosion’ you speak of. When I visited Paris last summer I observed a lack of business at the Metro bike-share locations at mid-day; however, at evening rush they were being used extensively, and by women. I do believe that bike-share could be most beneficial when combined with public transit. I do have my concerns about how biking in general hurts public transit at the fare box. There is a revenue gap and less frequent ridership does not help. Thank you for conceding that non-bike-share biking can be less safe than bike-share biking, owing to bike-share bikers being more cautious, moderate in speed and visible to other road users. Everyone should take note. Best about it will be the promise of safer biking through greater numbers. @sunsetpark thanks for your comment! NYC’s system is going to be massive, and should improve that ever-elusive measurement of quality of life in the city. This is just my opinion, but I think the revenue gap needs to be filled with more public funding and a greater philosophical emphasis on designing cities around the public transportation, rather than allowing massive sprawl that only makes it more difficult to connect everyone. That is to say, if bikeshare is denting the revenue of other transportation options, its not impacting public transportation nearly as much as high level policy decisions–IMO. Bikeshare has proven to be very safe in Washington DC/Arlington VA. 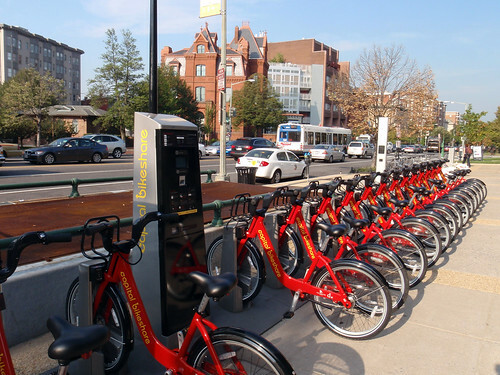 The Capital Bikeshare system registered 1 million rides during its first year of operation. There were only a handful of accidents and I believe there has only been one serious injury. That’s an amazingly low injury rate for any form of transportation. Lower than driving a car, riding a motorcycle or riding a private bike. I think it has to do with the design of the bikes. It’s very difficult to ride fast on the bikes. The upright riding position helps too, as does the heavy weight of the steel frame. In a minor accident at slow speeds, the bike is not going to flip over the way that a light road or triathlon bike would.